Archaeological investigations at Station Road, Arksey, provided an exciting opportunity to undertake a detailed excavation close to the historic core of a rural medieval and post-medieval village. Previously, Arksey was thought to have originated in the Anglo-Saxon period and pottery recovered during the excavation hinted that Arksey may have been inhabited as early as the 10th century. However, a small amount of Romano-British pottery, building material and glass that was recovered during excavation hinted that the origin of the village may have been much earlier. Although no known archaeological remains had previously been recorded within the development area, it was located close to the historic core of Arksey village. This meant that there was a high potential for encountering previously unrecorded medieval or earlier remains during construction works and an initial evaluation by trial trenching was recommended. 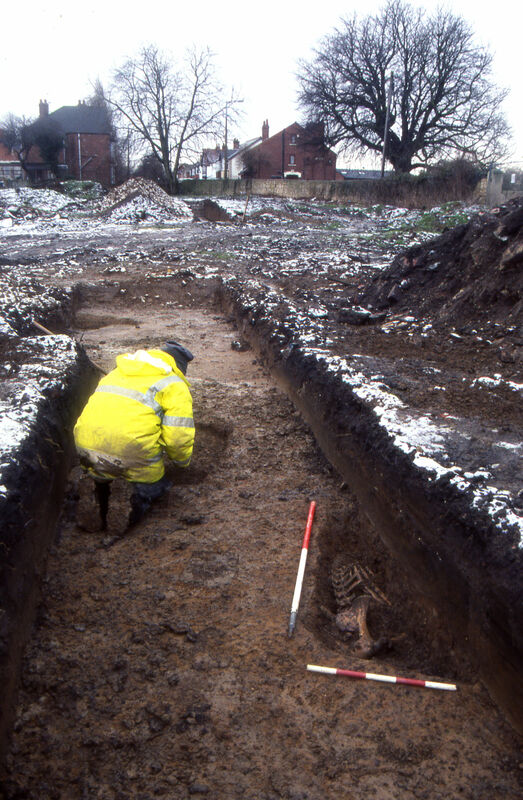 Seven trenches were excavated across the site in positions agreed with the South Yorkshire Archaeology Service to target the areas where the development would potentially disturb buried archaeological remains. 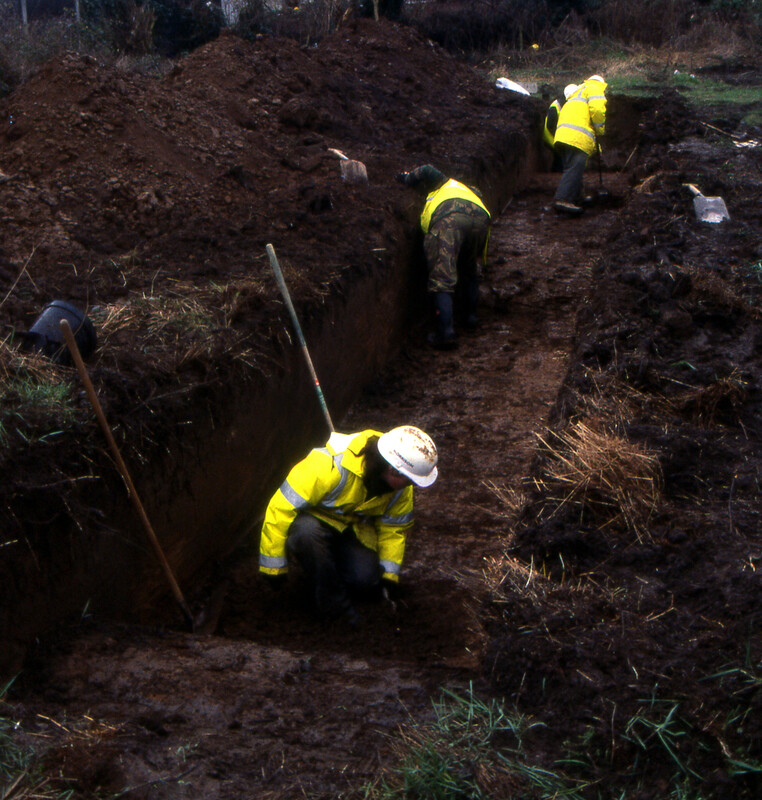 Archaeological features identified during the evaluation included walls, ditches, gullies, postholes and animal burials. The earliest features recorded seemed to date to the 12th century, although 10th-century pottery and Roman artefacts were also recovered. However, the majority of the archaeological remains were dated to the 13th to 14th and 15th to 16th centuries. Evidence of industrial activity, including smelting and smithing slags, was recovered from within a number of the medieval pits, postholes and ditches. One very large feature was identified toward the southern limit of the development area and contained preserved environmental evidence and insect remains. "...the archaeological evidence recovered during the excavations have the potential to give a changing picture of life in the village of Arksey over a long period of its early history..."
As a result of the trial trenching, an archaeological excavation was conducted within three areas where the construction work would have destroyed remains identified during the evaluation. The mitigation work was undertaken in several stages; firstly, the area of a new access road was machine stripped under archaeological supervision and the plots of land where medieval or earlier remains existed were then investigated. The groundworks were monitored in other areas, but no further archaeological remains were exposed. The general layout of the archaeological features suggested that the area comprised plots of land behind buildings on an old street frontage. A concentration of pits, gullies and postholes recorded along the north-western edge of Area 2 may have represented activity within the backyards of these former properties, but any associated structures must have been outside the development area beneath the modern road. 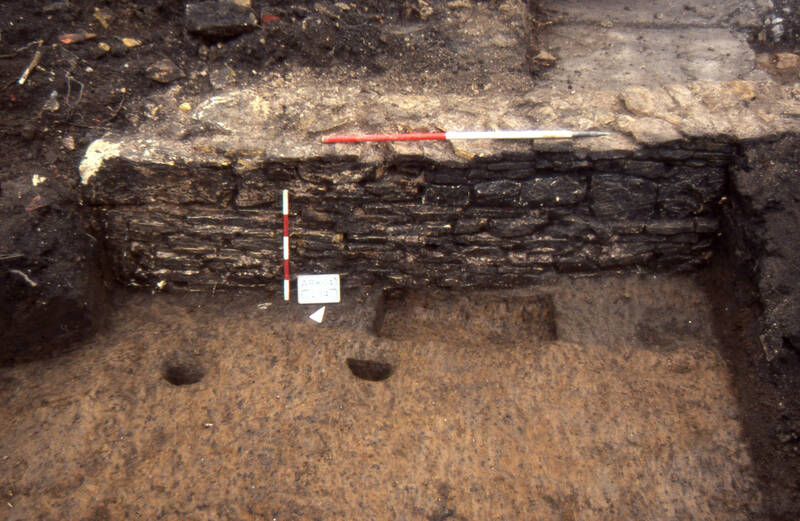 A wall recorded on the very edge of Area 2 was believed to be part of a building but pottery found under and associated with the wall dated the building to the post-medieval period and thus the structure was unrelated to the majority of the recorded features. There was evidence for Romano-British activity on or near the site in the form of sherds of greyware and samian, a fragment of possible blue-green window glass, brick, pieces of hypocaust and opus signinum (a type of ancient concrete). This material may have been redeposited into features of a medieval date, but an early ditch that was on a different alignment to the majority of the medieval boundary ditches, gullies and fence lines may represent part of an early medieval or even Romano-British settlement. The pieces of broken pottery recovered during the excavation included Anglo-Scandinavian sherds dated to the 10th or 11th century, some of which were of the rare Torksey-type. The medieval phases of activity comprised mainly boundary features that seemed to separate the area into plots of land and a multitude of pits of varying size. Most of these pits were small and contained domestic rubbish and fire-waste, but a few were distinctively larger and deeper. One of these large pits had postholes cut into the base, possibly relating to its original use. Another large pit had been re-cut several times and at least two cow carcasses had been dumped into it after it had partially silted up. Cattle skeletons were also recovered from two burials and two mostly intact pig skeletons were recovered from pits in Area 1. A large amount of slag and industrial waste was recovered mainly from the features recorded within Area 3. The material contained a number of forms of industrial waste including smelting and smithing slags, fired clay, hammerscale and prill, suggesting that Area 3 represented the backyard of a property engaged in some form of iron working. A considerable amount of iron and copper-alloy objects were recovered during the excavation. These included a few domestic objects, such as a button, buckles, a strap-end and part of a possible iron pan with a wooden handle. However, the majority appeared more representative of an agricultural or industrial setting, including an iron snaffle-bit link, a small bell, a lead spindle-whorl, fragments of three knives and two possible chisels, and a considerable number of iron nails, strips and bar fragments. Most of these objects were functional and utilitarian, though a decorated belt mount and dagger chape appear to have derived from relatively expensive and high-status objects. Two fragments of medieval glass, one from a small vessel, also represented objects of relatively high status. Later phases of activity recorded during the excavation included boundary ditches, layers of building rubble and four wells. 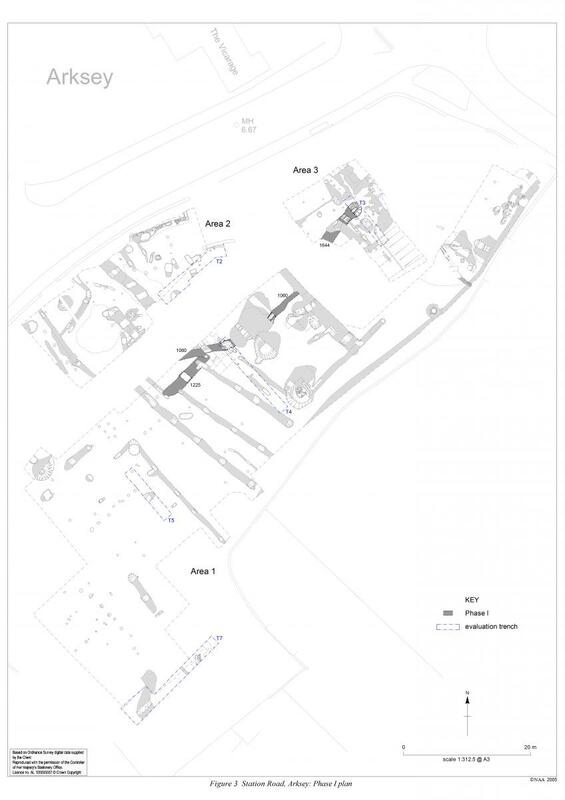 The post-excavation analysis is ongoing and with a further detailed study of the distributions of the environmental and industrial evidence, specific areas relating to the day to day economic activities carried out on the site can be identified. A refined phasing of the excavated features will enable changes in agricultural and industrial activities relating to the development of the village as a whole to be investigated. Thus the archaeological evidence recovered during the excavations have the potential to give a changing picture of life in the village of Arksey over a long period of its early history, a subject about which little is yet known.